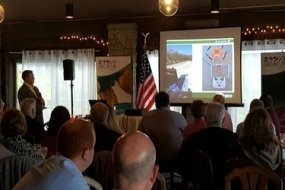 October 27 – Drone and UAV technology is rapidly improving and Ag Technologist Chad Colby is encouraging Macon County farmers and agribusinesses to get on board. Colby was the featured speaker at today’s Greater Decatur Chamber of Commerce Ag Café at the Beach House. He’s the founder of Colby AgTech , the General Manager of Central Illinois Ag, and a farmer. Colby has dove into the Ag technology scene and now he travels the Midwest sharing what he’s learned. Colby is a licensed UAV pilot and tries to get his hands on all the new drone technology. Drone tech continues to improve. During his presentation Thursday, Colby went over different types of drones and attachments. New cameras coming out allow for thermal imaging and up to 180-times zoom capability. Drones have become popular in the Ag world for crop risk assessment and many more applications. Colby says drones can really improve your crop by finding where problems are. Colby says drones allow you to pinpoint where a problem is and the accuracy will continue to rise in the future. Drone use goes beyond agricultural applications. Colby says they are used for insurance, search and rescue, roof and bridge inspections, etc.